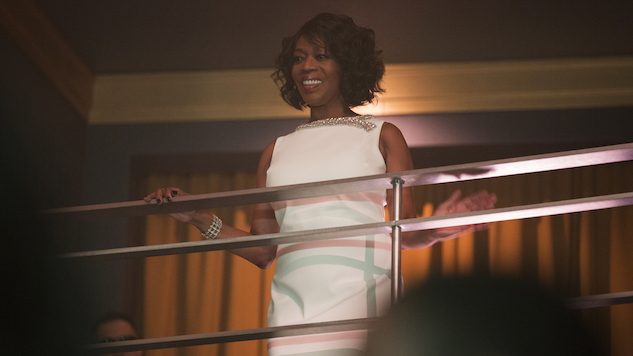 Even considered separately from Mike Colter’s bulletproof hero or Mustafa Shakir’s merciless challenger, Dillard’s arc in the first two seasons of Luke Cage—from unscrupulous politician protective of her community to “Big Bad” protective mainly of herself—is as compelling as any antagonist on television, in part because Coker and co. lean into her descent. Though it happens by increments, there’s no confusing Mariah Dillard for an anti-heroine: Woodard’s blistering performance, suggesting at once a figure of real fragility and an emotional manipulator of the first order, ensures that the character defies easy categorization. Not that the actress admits to any such difficulty—for her, the point is that Mariah Dillard is the heroine of her own story. It’s Woodard’s willingness to get under Dillard’s skin that enlivens the character, transforming the sort of craven pol familiar from House of Cards (or, frankly, Congress) into a human cannonball. Her detonations are delicious: In the season premiere, when a waiter refers to her as the “aunt” of much younger paramour “Shades” Alvarez (Theo Rossi), she coos at her “nephew” while sucking his thumb; in the second episode, she shrieks at an unexpected hurdle as if in physical pain. In fairness, though, Woodard has a rich vein of material to work with, especially after last season’s flashbacks to the Stokes crime syndicate’s frightening matriarch, Mama Mabel—through which we come to see that she, as with many of the most mesmerizing villains (real and imagined) has been on the receiving end of evil, too. See, hear, feel, even fear: In Coker and Woodard’s hands, Mariah Dillard is the antagonist no one’s talking about, but should be. And not for long. Season Two of Luke Cage is now streaming on Netflix. Read our review here.